Nashua-based VGo will provide a “telemedicine” robot on the sidelines of Dartmouth College’s home football games, as part of a remote concussion assessment pilot project. The program started at the first home game on Saturday, Sept. 20. This pilot is part of a Dartmouth Athletics initiative in which the Dartmouth-Hitchcok Center for Telehealth will provide real-time, emergency clinical support via virtual technologies to a variety of Dartmouth sports, said Drew Galbraith, senior associate athletics director for Dartmouth Peak Performance. VGo enables a user to replicate themselves in a distant location. Using an iPad or laptop with webcam, the user can hear, see and more around in the distance location. In this case, the doctors from Dartmouth-Hitchcok Center for Telehealth will be on the sidelines at Darmouth College football games to provide concussion assessment, if needed. VGo has focused on the medical market, deploying the robots with visiting nurses and in hospital settings, to allow doctors better long-distance care. Several other companies, including Roomba-maker iRobot itself, offer similar devices. Dr. Sarah Pletcher, director of the Dartmouth-Hitchcock Center for Telehealth, said Dartmouth-Hitchcock Medical Center’s section of neurosurgery will be providing remote assessments of Dartmouth players with suspected concussions. 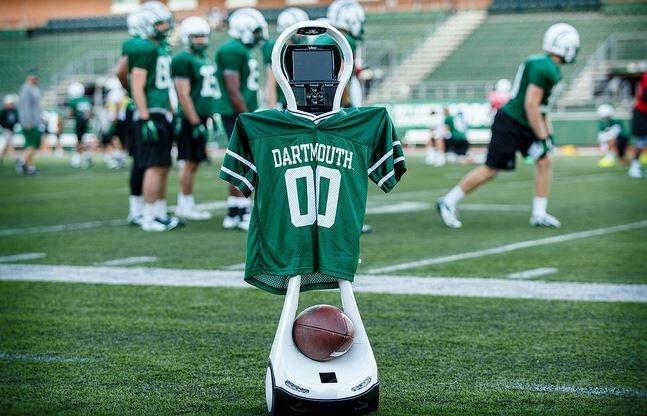 “In addition to a telemedicine robot, we will also integrate tablet and smartphone solutions that will offer reliability and flexibility as we expand the program to other Dartmouth sports in the very near future,” said Pletcher. Physicians from the D-H emergency department will be participating in future clinical service offerings.